This trimester, I took the enrichment: Engineering 101: Hydraulics. This enrichment was the first exposure of hydraulics to many people. Hydraulics is the principle that liquids cannot be compressed. This means that the amount of energy that you put in one side of the hydraulic is transferred to the other side of the hydraulic. For more information on hydraulics, you could visit the following website: https://www.explainthatstuff.com/hydraulics.html. What we did for an entire third of the school year was come in and work on a hydraulic-related project. The project we “embarked” on was making a scissor lift. I worked on this for 3-5 weeks. Eventually, I worked on a hydraulic fan. This took a lot of work because I had to individually 3D print gears and gear strips. Fortunately, it worked first try. One thing I learned about hydraulics is that if you can pair it with a different energy transfer method, that’s when it gets super cool. For example, I paired hydraulics with gears to get the hydraulic-powered fan. One mistake I made and learned from was a lack of good planning. After 3 classes of 3D design and cad. I got my gear pieces returned to me. They worked! After that, I tried winging the rest of the project. It took me roughly 6 or 7 classes before I regrouped and developed a plan to conquer this task. A piece of advice I’d give to someone next semester is work on something that you had the idea for. This project was a lot of fun because I made something where I had the original idea. I know a few people and groups followed DIYs and google images. I believe that you shouldn’t do that because it doesn’t feel like your own after you’ve finished. Mine feels unique and different. I love that I conceived the idea and was satisfied by the result. My L21 focus for this project was problem solving. My problem solving skills were used when I thought about changing from hand cut id card holders to laser cut card holders. This meant that our id card holders became more precise and uniform as well as less bumpy and rough. To summarize what happened throughout the week, I’d say the first two days were building prototypes. Then, the next two days were spent designing vector drawings and laser cutting the final prototypes and final product. I developed laser cutting skills and vector drawing skills. For me, the highlight of the week was figuring out (on a personal level) how plastics are made. Over the course of today and yesterday, I made two prototypes that were laser cut. I made a vector drawing of an id card holder that worked for the most part, but a lanyard couldn’t attach because of the thickness of the vector drawing. Today, I improved on that design and added a thinner clip that would let the lanyard clip on. Then, I had an idea that instead of having three pieces that were glued on individually to create a rough shape of a rectangle I decided to make a vector drawing of the new design. But, we ran out of our previous plastic material. So, we made a new cake! This cake is a very beautiful shade of blue and green. The most challenging part was just finding time to get things laser cut, as well as just having to wait for somethings to be made. We used feedback to improve our design. This is at work when we had to choose our plastics to use in our final product. Instead of using a clear or black plastic, somebody recommended that we use a colorful plastic to make it fit in with our school colors. Today during Snazzy Plastics, we created four prototypes of our id card idea. 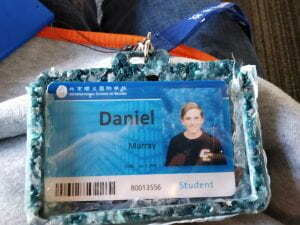 Additionally we made a lanyard to go with the plastic cards. 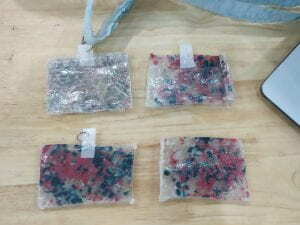 We used soft plastics that were made out of heat pressing other soft plastics together. We also used hard plastics made out of HDPE and that was baked into a cake. A plastic “cake” is a large rectangular shape made by shredding plastics and them melting them again. We took a cake and cut it into roughy 10 x 7. Then, we took our soft plastic and hot-glued it onto our 10 x 7 sheet. However, throughout our prototyping, we noticed that our cutting technique isn’t great. Instead of using the saw to cut the cake, we have developed a vector drawing with Adobe Illustrator of our id card so that we can make precise cuts using a laser cutter. After cutting these things, we will consult with classmates and teachers to collect feedback on ways to improve. When we generated ideas, we used the internet to spark conversation. In time, that conversation made us do more research. After that, we settled on id card holders. 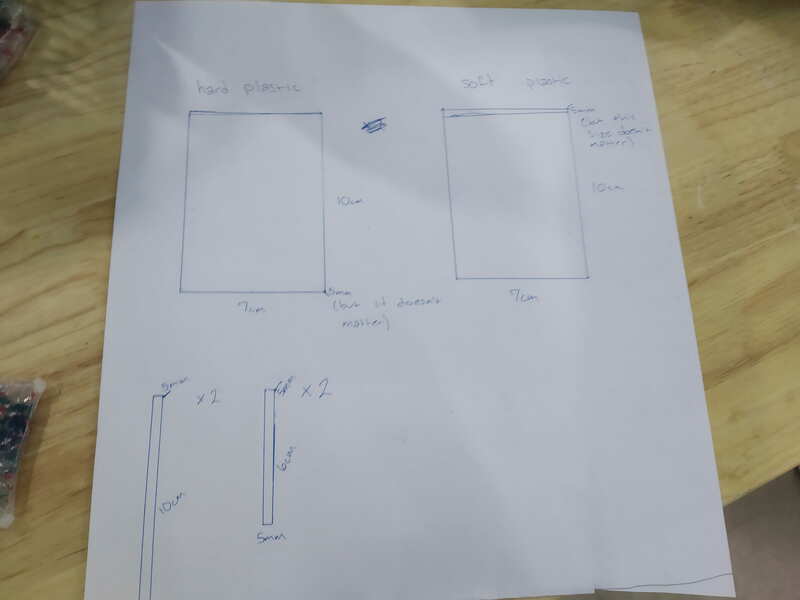 The first picture below is a photo of our initial sketches. In the top row of the second picture above, are two prototypes. After feedback from peers, they decided that they liked the precision cut and tightness of the plastic in the top left prototype. On the contrary, some peers liked the top left prototype because of the more clear plastic used. After the feedback, we made two standard issue card holders, which are on the bottom of the picture. The problem in Snazzy Plastics that we’re trying to solve is how to repurpose plastics for other and different uses. The solution that we (myself, Ryan and Shokhin) decided to do were wallets and other accessories that can store items. I was originally thinking about building a contraption that would spray water and cool down the user. However, I realized that it would take too many extra materials. Obviously accessories such as wallets and backpacks are targeted towards everyone. Despite our initial ideas, Shokhin found the Fantom wallets online: https://www.google.com/search?q=fantom+wallet&source=lnms&tbm=isch&sa=X&ved=0ahUKEwjUjrL8hrPgAhUYQN4KHbvbDuwQ_AUIDigB&biw=1280&bih=721#imgrc=trt7U36GXunshM:. One thing led to another and all of a sudden, we weren’t thinking about wallets anymore, we were thinking about id card holders. I loved this idea because when walking around the school, I think it would be very cool to have personalized id card holders with my favorite colors and design. We used the caliper to measure the depth of our ISB id cards. Then, we used a ruler to measure the height and width of our id cards. Our (intentionally) rough measurements led to be 6cm x 10cm x 0.075cm (0.75mm). The ideas that inspired us were mainly: A) the Fantom wallet and B) the durable plastic bag made by a high school student that rests in the FAB LAB. I believe that the most challenging aspects of this project will be making a mold for our final product. I believe that this challenge will spark a lot of research in us. For One Day, I built a website! However, I decided that I didn’t want to rely on Weebly, Wix, WordPress, or other website builders. Instead, I wanted to code a website using CSS and HTML. I used a website called https://codepen.io/ to develop my website. It allowed me to enter in code and see what the output is. My website address is: https://expatinternational.000webhostapp.com/. The .000webhostapp extension allowed me to upload HTML and CSS files onto a free webhosting app that would then upload them onto the internet. The main challenges that I faced were: how was I supposed to learn this stuff? If you visit the website, you’ll see that it is very minimalistic because the majority of the day, I spent learning the two coding languages. I used youtube tutorials as well as courses that taught HTML and CSS. I finally learned how both languages coincide. I believe that One Day is important because every student has an passion that they should be able to show, discover, feel, learn, share and grow in. I believe that this school is really great at allowing students to discover their passion and then empowering the students to learn and grow in it. For example, my passion is computer science and I rarely find time to learn computer science. But yesterday, during One Day, I learned how to build a website using front-end web development techniques. My goal is to grow and expand in web development. I want to be constantly editing and building on this website. However, that means that if you are looking at the website way after I’ve posted this, I’ve probably made some changes. If you visit the link: https://codepen.io/DMurray/pen/ you’ll find the original One Day project and how it looks. But, how will I develop my website? The first thing I’ll do is make my own graphics and videos so that I’m not using some random graphics and videos off of the internet. Next, I’ll try to make a login or sign up screen that will also connect to a back-end Java program that will store all of the accounts. After that, I’ll make an actual forum that people will be able to post on. And finally, I will make more tabs at the top that will link to other HTML and CSS files. For One Day, I chose the activity, “Creative Publishing”. Creative Publishing’s only constraints are: you have to create something. Then, you have to publish it on any platform. I originally chose to use the coding language, “Swift” to make an IOS application. After learning some of the basics about Swift using: https://www.sololearn.com/, I decided that I wouldn’t learn enough of the language in time for One Day, and I wasn’t entirely having the most fun trying to cram all this knowledge into my head. Then, the straw that broke the camel’s back was the newest version of mac was required, and I couldn’t download the newest version of Mojave. What did I do? A week before One Day, I started an online course on https://www.edx.org/. This was totally unrelated to One Day, but this website is a website that allows you to learn a college level course very easily and it requires a minimal time commitment. So, after starting a class in the Computer-Science tab on HTML5 and CSS, I decided to dive in the shallow end of web-development. After about 2-3 hours of the course, I decided that I probably could post a minimal website with my knowledge of CSS and HTML. So, I decided to resort to building a website for One Day. The relationship between consumption and sustainability was quite obvious the more that we explored sustainability, how to live sustainably and how to make sustainable choices. When there is more consumption, there is a larger shift of money from consumers to producers. These producers then keep the money, and recycle very little of it back into making the product. When we shop, we support the linear system that starts from extraction and ends with disposal. Notice how the system is linear, meaning that there is no cycle. Instead of living sustainably, our economy is pushing these large corporations to make more products. But when they make try to make the products cheaper, the environment and our society suffer. Project Consume’s main message was to reduce and refuse plastic products and try to drive us to understand the impacts that plastic has on our world. The goal to make a sustainable change is to reduce our usage of plastic, and therefore, weaken our support for the linear system. At our exhibition, we had lower-elementary students watch our videos. Afterwards, we requested them to provide us with feedback. Most of the feedback I received was positive. They mostly got the message that I was attempting to convey (which was to reduce plastic usage) and they changed their perspectives on “buying stuff”. One funny piece of feedback that really made me realize that I was changing these little kids’ minds was one boy commented, “It was too sad.” Most children said, “Plastic is bad.” or “Buying stuff is bad.” Although, these comments are fairly basic, it shows that the audience pulled away the right message. The children clearly got the right message which made me feel glad that I changed their minds. How does consumption impact sustainability? How can we make a sustainable change? Some interesting things I learned about are: plastic in the food chain, the chemical composition of plastic, and how plastic affects society as well as the environment which helped me to understand the three pillars of sustainability and how they work together in a real life example. For example, satisfying all three pillars is a balancing act. When you support the economy, for example using and selling plastics affects people, because typically, those who are involved in the creation of plastic are paid and treated with minimal care to keep prices down. Also, the obvious sacrifice of environmental protection with plastic. The more you benefit one pillar, the more another pillar is in jeopardy. Watching the Story Of Stuff video changed my thinking because for the first time, I learned about the concept of externalizing the costs. Which is a concept of making sure that there are minimal costs for the company, so that they can sell products cheaper. Usually, this results in low wages and environmental sacrifices. Also, when the woman talking laid out the system that we use for consumption, it was linear. She said, “You cannot run a linear system on a finite planet indefinitely.” And for the first time, I thought about how we are completely doing that right now. The driving question impacts me because I know that I can make a difference, too. The question reads, “What is the relationship between consumption and sustainability?” I know, that if I reduce consumption, then I can make a lasting impact on our world. Looking back on Project Consume, I realize that I can reduce my “carbon footprint” and make sure that single-use plastics aren’t used. The core is plastics and how they affect sustainability. For example, plastics may be supportive of the economy, but society and the environment severely suffer. However, a big question I still have is, “How much can one person’s consumption affect our world?”To make a sustainable change, the best things to do are A) reduce your plastic usage, and B) purchase goods from companies that make it their goal to make sustainable choices. If you reduce and refuse, then you don’t support the linear chain. And if you have to pay a few extra bucks to make a more sustainable choice, then do it! The littlest bit of contribution goes a long way. Why I chose my profile? I chose my avatar because I enjoy playing baseball and soccer. I also am from America. I feel like this avatar also looks the closest to me. When I was working with the Makey Makey (a device that allows you to directly work with the computers controls), I realised that there are a lot of things that you can do with it. With Scratch, realised that there are even more possibilities with the code. My audience are parents, teachers or students. I noticed there was a need for precise, quick, and easy calculations. I hope I am able to overcome the challenge of limited inputs. On the Makey Makey board, there are only 12 inputs: w, a, s, d, f, g, space, mouse click, up arrow, down arrow, right arrow and left arrow. I found a way to overcome the challenge. I thought about a grid that was four spaces by three spaces. That would allow 12 inputs by only using 7. Then, I could wait on the number for a few seconds, allowing people to add on numbers. They could press 9 and 7 to make 97. But, they have to insert the numbers within 5 seconds of each other so that they could move on to the second number in the number sentence.